We can't pick our parents and the limbs that we're born with but if we could we'd choose a magnificent tail over two functioning legs any day. (We wouldn't change our parents though cause we love them.) The life of a mermaid is more exciting than the life of a human. Why be confined to an office all day when the ocean knows no bounds. Because mermaids can't be restrained, we choose to identify as a 'land mermaid' instead of a human. ('Land mermaid' has a ring to it, right?). If your destiny is to swim alongside the miraculous merpeople of the world, then carry your keys as the finned-folks do by using the mermaid lanyard. The bright yellow fabric lanyard features printed blue scales and silhouettes of mermaids in different poses on both the front and the back. The plastic buckle clasp can detach so you can easily string on all your keys and keychains. Please note, there's a plastic release clasp located on the back of the lanyard for safety purposes so if the lanyard gets tugged it will separate. 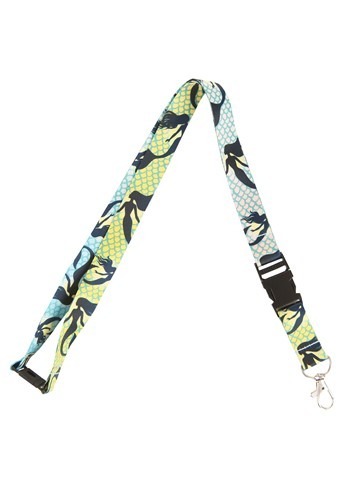 Use this lanyard to conveniently keep tracks of all your keys or accessorize any mermaid costume with it since tails and pockets really don't mix.